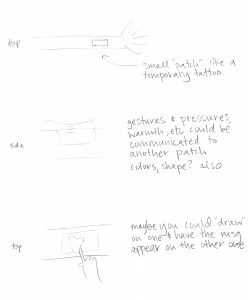 We are proposing a patch that you wear on your skin. The patch can generate warmth, light (possibly in shapes), and pressure. The receiver can then send these sensations back to the original sender. See sketches below for examples. Small patch, worn on the arm (similar to a temporary tattoo). 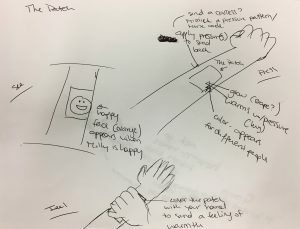 Allows for sharing gestures, like a stroke of the arm, or sharing a drawing that you feel and that appears on your patch. Pre-determined shapes (ex: happy face) could be shared when experiencing certain emotions. Can also share a feeling or warmth of a ‘hug’ via a pressurized warmth.